You not only have to have quite a bit of confidence in your technique as a chef but you must also have an engaging personality to pull off an intimate chef’s table with a small group of discerning guests. Limited to nine seats with diners separated from your preparation space by a slim counter alone means attention to the details and an operation that performs like clockwork is essential. To be able to entertain on top of that while choreographing a fine wine pairing brings expectations to another level. 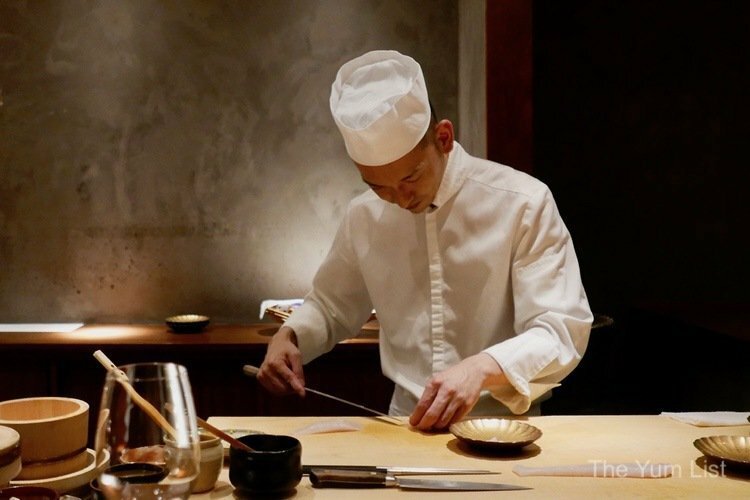 Chef Makoto Saito, of the recently opened Sushi Hibiki in Four Seasons Place KL, proved recently that he could teach a few lessons in the art of culinary conquest and keep guests smiling while at it. 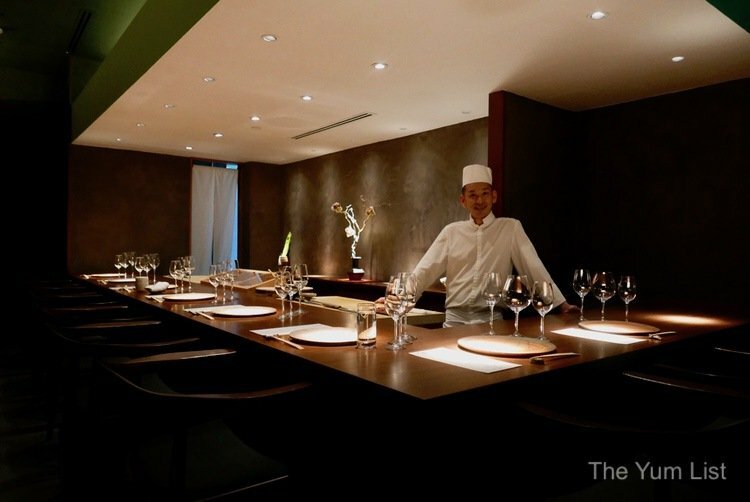 This Japanese restaurant, Sushi Hibiki, is somewhat hidden in the basement of Four Seasons Place KL. Concealed behind a premium oyster bar, the entrance is a simple opening in the wall. Cool polished cement is given warmth with wooden chairs and tables. Soft downlights direct focus on the space where your meal will be placed and a chilled contemporary mix of jazzy tunes softens the air. Hibiki means echo and harmony in Japanese and we’re just about to see those words put into action with fine wines paired with an omakase menu of premium ingredients from Japan. 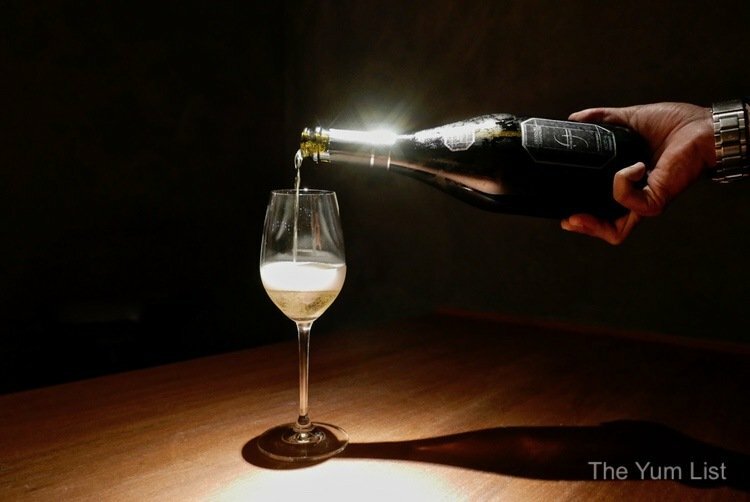 Marcus Lai, Master of Wine candidate from Asia Wine Cellar (a fine wine importer in Singapore focusing on premium wines from France) joins the fun and has chosen vintage and non-vintage Champagnes and Burgundian wines to match Chef Saito’s menu. 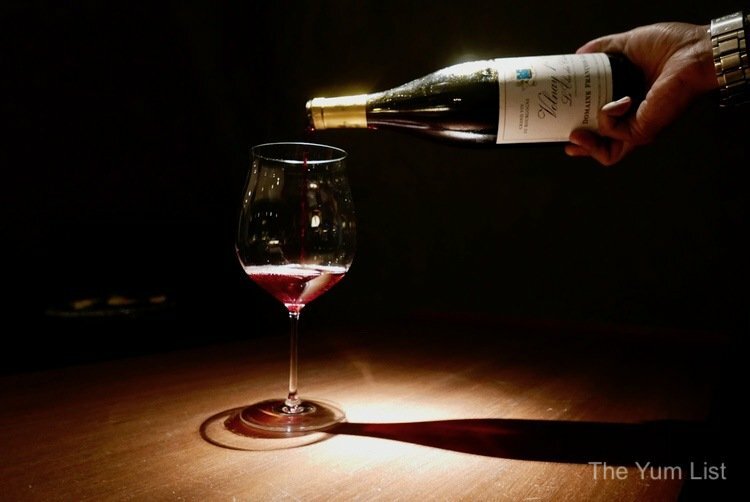 When quizzed about the “why” of his selection, he shares that Japan was one of the first countries in Asia to import Champagne and fine French wines, even before Hong Kong and Singapore. 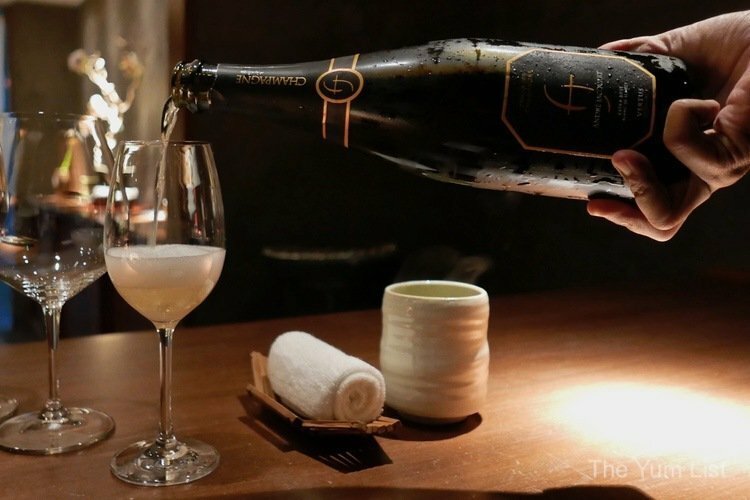 These fine wines match the delicate flavours of high-quality Japanese cuisine. The launch is very good. 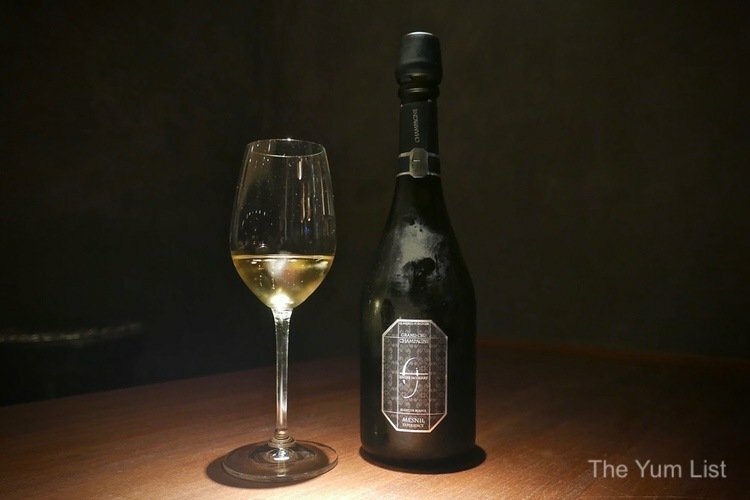 Rated the top 2018 entry Champagne by Decanter, the Andre Jacquart Vertus Premier Cru Blanc de Blancs is shiny gold in the glass with enticing aromatics of flowers and melon. The character is maintained in the palate with fruit, zest and a mild creaminess. 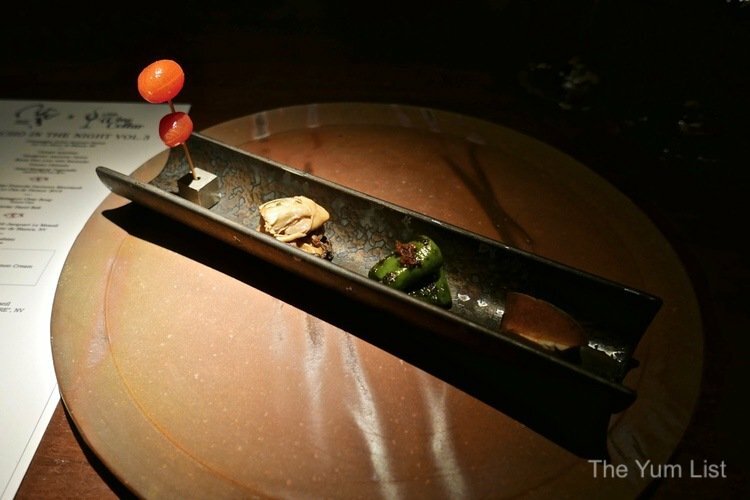 Delicate bubbles play gently with chef’s tray of appetizers. 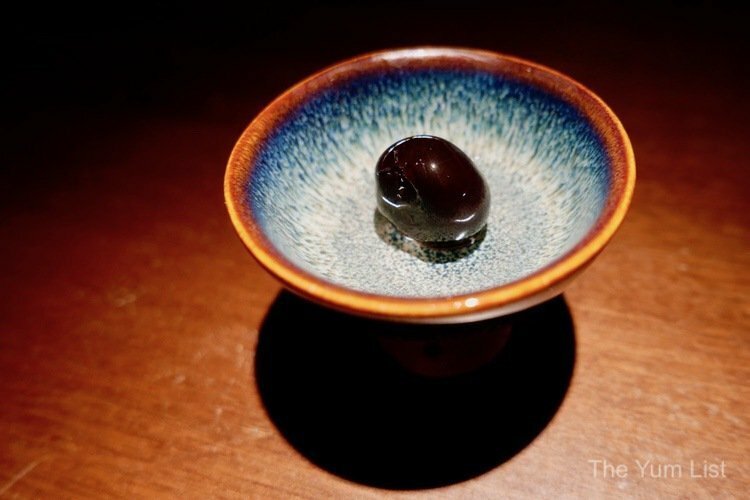 Eaten from left to right, the Tomato Ohitashi is peeled smoothly offering a balance of tart and sweet. The Vinaigrette Japanese Oyster lifts the intensity of acidity a notch and Fried Manganji Togarashi (Japanese chilli from Kyoto) is chargrilled providing a distinctive smokiness in the mouth. Lastly, Monk Fish Liver with Narazuke (pickles from Nara known for their distinctive aroma and sweetness due to their pickling in the lees of sake) is smooth and creamy. 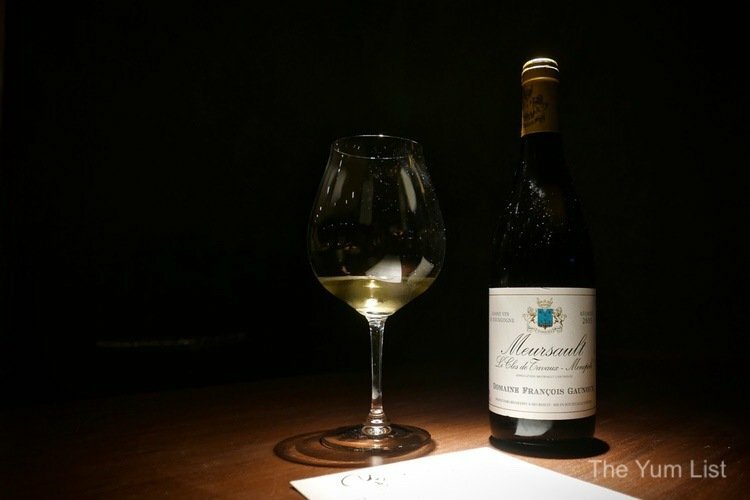 Our next wine, Domaine Francois Gaunoux Meursault Le Clos de Tavaux 2015, comes from the most highly regarded region for Chardonnay in the world, Burgundy. Marcus attributes the elegance of this wine to the touch given by the female winemaker. He says the family owns the entire vineyard and that 2015 is a good ripe vintage. It presents a bouquet of flowers with light mineral elements and offers layers of complexity in the mouth with stone fruits and spice. Its crisp acidity complements chef’s soup and hand roll, which are about to be delivered. Chef Saito tells us that the usual way to prepare Hamaguri Clear Soup with Oriental Clam is with sake but for this evening’s pairing, he has used white wine instead. Clam stock, salt and a drop of soy sauce enhance the flavours of the mollusc and chef joyfully announces that you can now get fresh ingredients directly from Japan four times a week (when he first moved to KL it was only twice). 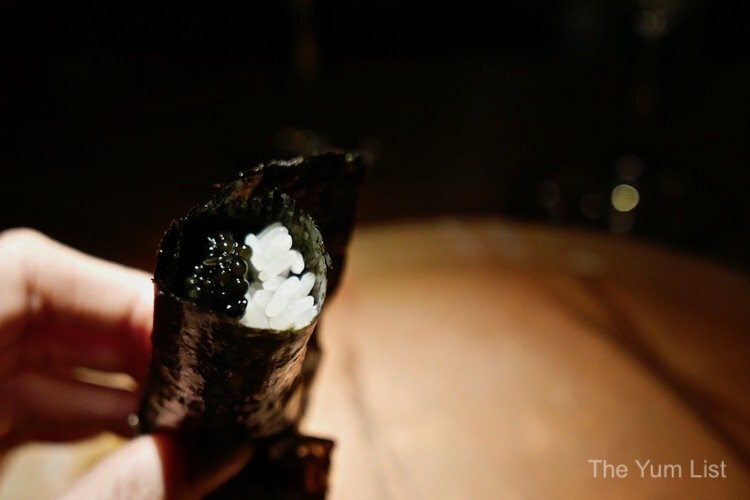 The Caviar Hand Roll is literally handed to us as each one is made right in front of us – there is no kitchen to plate service here – it is couriered hand to hand to mouth. 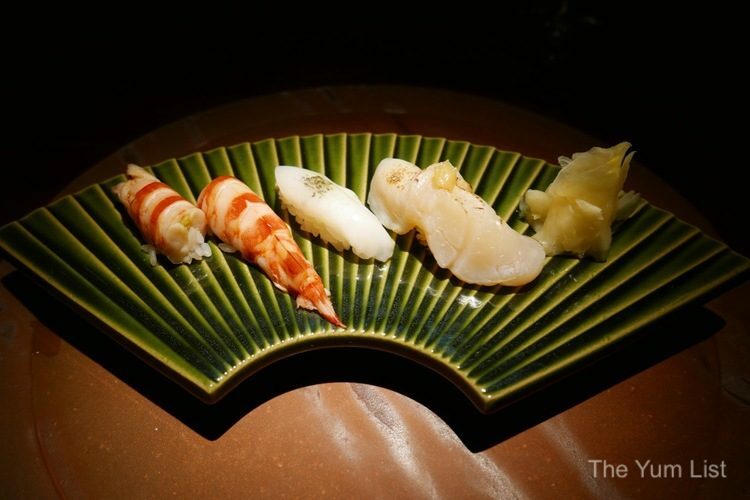 Chef boasts that the seafood coming from Tokyo, Kyoto and Hokkaido give him better access to ingredients than if he were living in Japan itself as product networks locally are not set up for regional coverage. So the saying that you have to visit Japan to get the best taste of the country might not necessarily hold true. 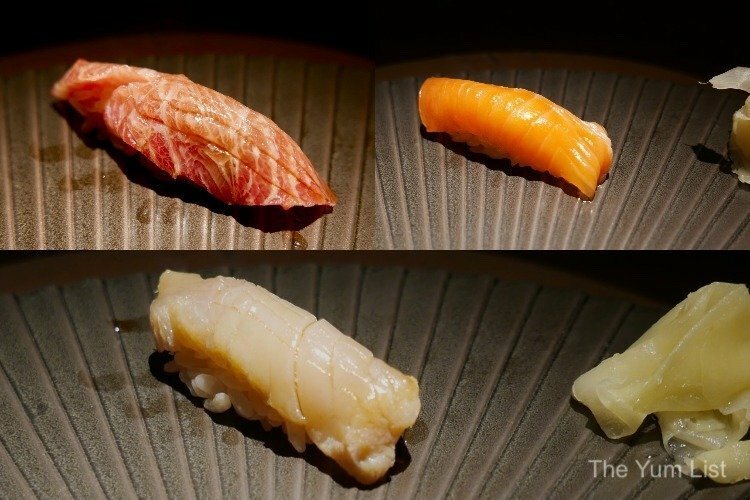 Maybe you should rather consider visiting Sushi Hibiki to get the full Japanese experience…. The tiny bit of dosage in the Champagne Andre Jacquart Le Mesnil Grand Cru Blanc de Blancs, NV makes it a great pair for the sushi dishes. It’s another aromatic Champagne with buttery toast and floral notes on the nose. With a sophisticated fine texture, it ends well-balanced with freshness and length. We take a good mouthful of this before considering the succeeding sashimi plate. 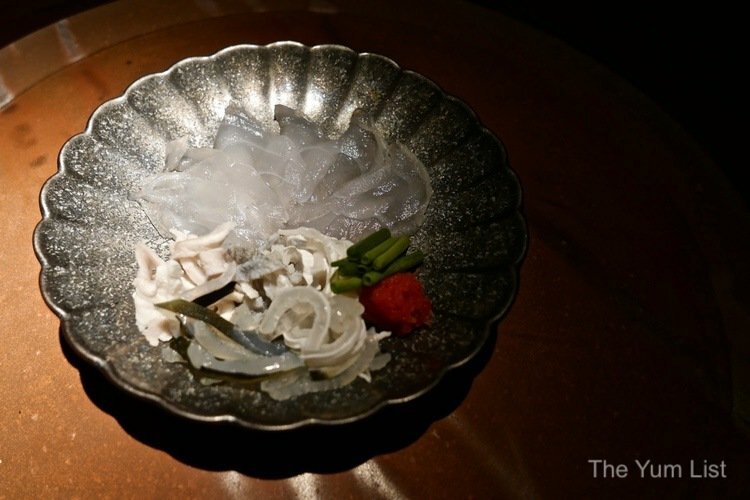 Deadly enough to kill 30 adults with the toxin from a single fish, Fugu (puffer fish) Sashimi is no afterthought on a menu. Chef assures us that even though he doesn’t have a license (gasp!) to prepare the lethal fish, nowadays it’s not needed as you can source the meat from a certified supplier without taking the whole fish. Apparently, the license is not awarded based solely on the chef’s skill in slicing the fish without touching the vital organs but also ensures the safe storage of the poison once discarded – it must be kept under lock and key. At Sushi Hibiki, it’s presented with the house made ponzu sauce that supplements its mild flavour and chewy texture. We’ve all survived (and taken a few extra sips of liquid courage in the process) so move onto the course of sushi. Chef instructs that we can eat with our fingers, “It started as street food; just like Jalan Alor.” He sports a sassy smile as he pays homage to Kuala Lumpur’s famous area for street food. Three pieces of expertly cut sushi follow: sumi ika (cuttlefish), kuruma ebi (Japanese tiger prawn) and hotate (scallop) with lemon cream (torched just before serving). Chef grins as guests show appreciation for the freshness, saying, “It was alive just five minutes ago.” Each piece of sushi is put on our plates as it is made and the rest of the guests eat each piece as soon as it arrives. I’m waiting, however, to capture a photo of the trio all in one shot. I’m feeling some tension from the chef and probe as to the reason. He explains, “The rice is warm. The fish is cold. You put them together and you have the perfect balance of temperature. You have 20 seconds to eat each piece as the quality fades every second onwards and a little piece of the chef’s heart dies with it.” Okay. I have metaphorically just killed the chef. Just eat the damn sushi! You can borrow my photos, just don’t make the chef suffer over the perfect Instashot. Guilted into putting down the camera, I take a few moments to admire chef’s meticulous attention to detail. There is not a single drop of excess on his giant chopping board. He is constantly wiping and cleaning. I think he would make a great roommate. And, he has a great sense of humour to boot! Champagne Andre Jacquart Le Mesnil Grand Cru Blanc de Blancs “Brut Nature,” NV, with its zero dosage, pairs well with the tempura course as it accentuates the rich and savoury profile of the food, while its acidity cuts through the fattiness. Its luxurious creamy mousse follows through with warm elements, minerals and a rich depth of flavour. 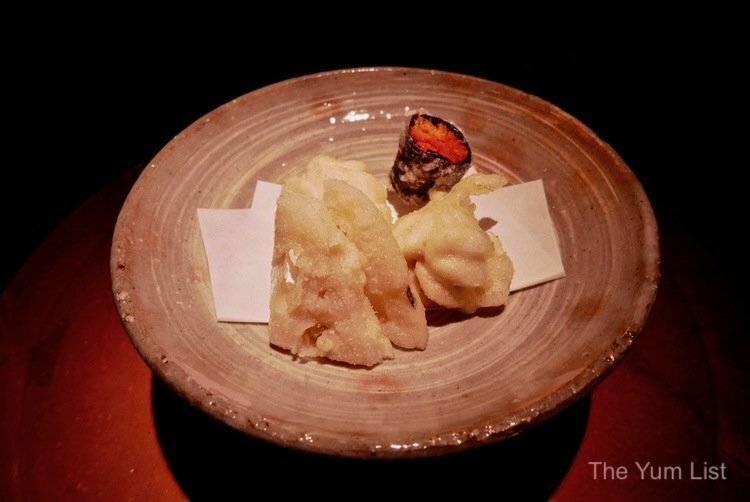 Shirako (cod treasure), Uni (sea urchin) and Renkon (lotus root) tempura have chef watching us closely as we consume all three waiting to hear which one is the favourite. Turns out this is not a so innocent interest of taste but a slight comedic moment the chef seems to take great pleasure from observing. He almost too eagerly assumes that the most popular is the “cod treasure” and as his enthusiasm becomes evident the lady diners give each other an expression of, “we know what he is up to,” while the men seem oblivious to the innuendos. As the descriptions – very creamy, explodes in the mouth, a little closer to heaven – come forth he reveals that we’ve just eaten cod sperm. After the fourth glass of Champagne, the ladies spill with jokes, “It’s an explosion in the mouth,” and, “Did you swallow?” Meantime, the gentlemen at the table are declaring that chef is not their friend. Be forewarned! It takes some time for the excitement to settle but the next course arrives and mouths are once again full. Ginzake – premium Japanese salmon, three times the price of the regular; Sawara – Spanish mackerel; and Fatty Tuna, are now on our plates and eaten within the 20-second expiry date! Warm rice, cool fish – now I’m paying attention to the temperatures. Chef gives me the once-over, a look of approval I think – I’ve eaten my piece of sushi after spending only 10 seconds on the photo and have it in my mouth before time is up. 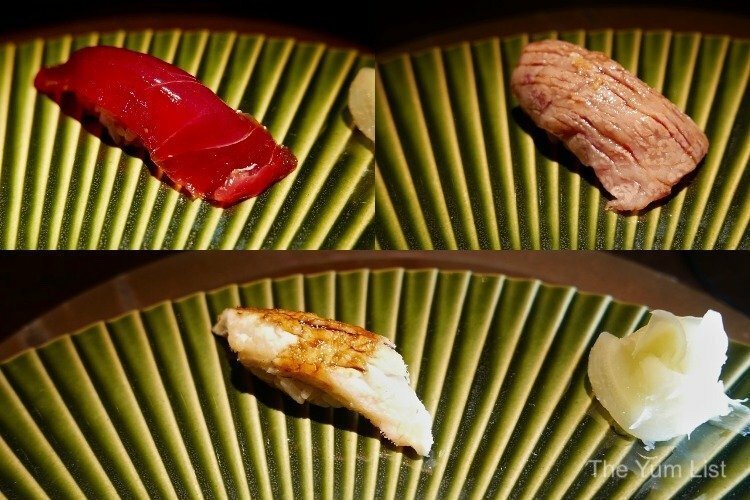 Reinforcing his ideology, chef recounts eating at Sukiyabashi Jiro (the most celebrated sushi restaurant in the world) and claims he ate 20 pieces in 20 minutes. He adds that talking to the chef is not allowed, “You must eat. Not talk.” Crikey, I have been given a schooling and Marcus chimes in on the fun-at-my-expense noting that it goes for the wine as well – you must drink at the ideal temperature, so drink up, the next selection is en route. Marcus introduces the Domaine Francois Gaunoux Volnay ‘Clos des Chenes’ 1er Cru, 2015 as the Holy Grail of Pinot Noir. Less than 15% of Burgundy is classified at premier cru so this is a pretty special drop. The terroir of Close de Chenes is ideal for the growing of this grape bringing out bright fruits, refined tannins and balanced acidity. Chef has thoughtfully put a more savoury character into the Buri (yellowtail), a white fish that would usually be paired with sake. 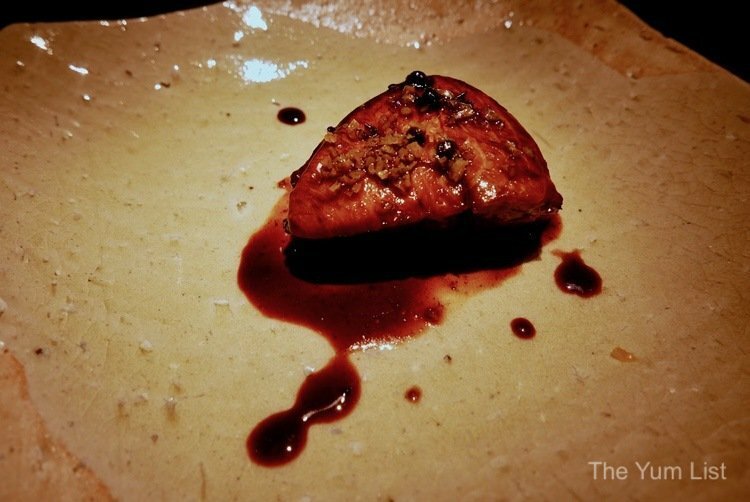 The bolder additions to the sauce – balsamic, grated yuzu, red wine, soy sauce and Sancho (Japanese pepper) – enable this recipe to handle the red. The final course of sushi also benefits from the addition of seasoning, making the wine a suitable match. Zuke, or tuna marinated with homemade soy sauce, is a vibrant deep red with a touch of wasabi. It reflects the light and is smooth both to the eye and to the palate. 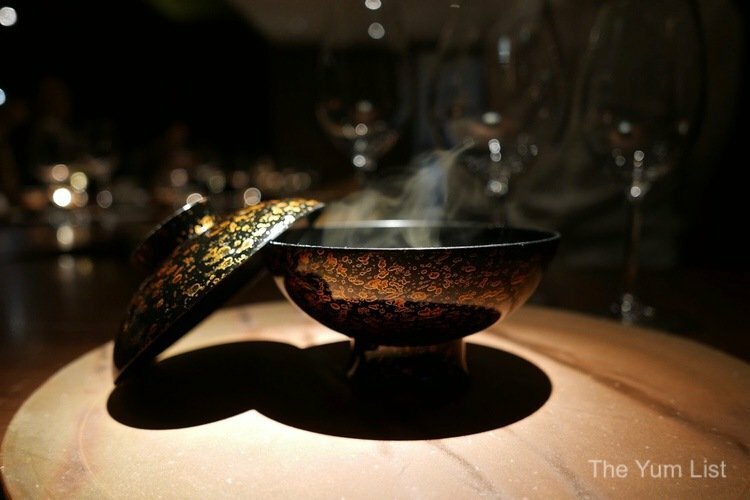 Anago (sea eel) is boosted with a sweet red wine and soy sauce and, in closing, Wagyu Beef, light and sauceless, gets a flaming with the blow torch just before serving. 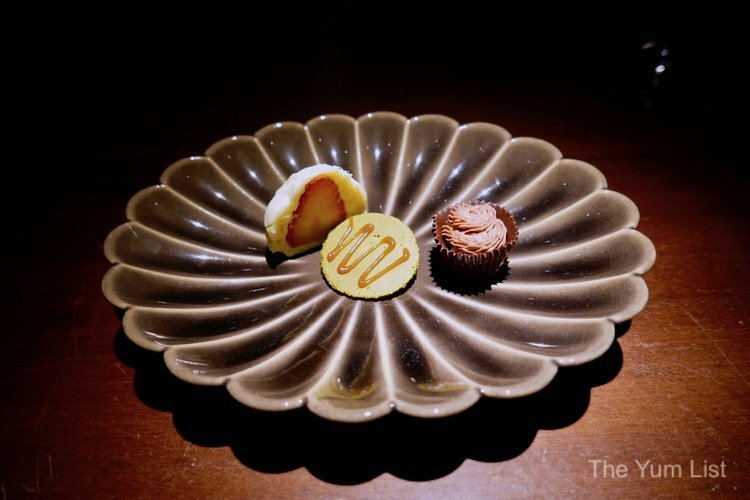 The chef at Sushi Hibiki can now take a break as he has sourced the sweet finale to a friend who is a chocolatier and runs LeGeci Pastry in KLCC (next to the Isetan wine shop). Cheese with yuzu white chocolate and strawberry, matcha chocolate with almond paste and dark chocolate with chocolate cream are eaten first with a final bite of decadence in a single port cherry to end. Wowing his diners with masterful kitchen skills while simultaneously entertaining them with anecdotes and providing education on the etiquette of sushi, chef Makoto Saito tripped a light fantastic at Sushi Hibiki with this group of KL foodies and oenophiles. Reasons to visit Sushi Hibiki: an exquisite menu of premium Japanese ingredients with the option of fine wine pairing; a highly entertaining chef; must try an omakase menu; a fantastic interactive evening – great place to bring a date. More on Japanese restaurants in Kuala Lumpur here. Japanese cuisine with a touch of class. Very elegant. I will wait for the desserts. Happy weekend! Wow you can get fugu in Malaysia these days? A very elegant place to dine and enjoy with the moody lighting that they have throughout! It makes it appear very cozy and intimate.